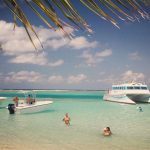 When I first started exploring Puerto Rico, I found what I was seeking: Caribbean beaches, stylish hotel rooms by the sea, a capital city with a pulsating beat and genuinely warm locals. What I never expected to find was a mouth-watering culinary scene. Contemporary Cocina Criolla is a fusion that mirrors Puerto Rico’s diversity and is a powerful lens into its history. Its predominate influences are indigenous Taíno blended with an ample measure of Spanish and African. Puerto Rico’s cuisine has become one of the strongest reasons for my return visits, especially to savory San Juan. Thanks to a nearly perfect tropical climate, Puerto Rico is a produce paradise. Island staples such as mango, peppers, plantains and yucca are the backbone of its cuisine. Scores of starchy root vegetables represent the way Borinqueños have been feeding their families for generations. The Spanish brought rice to the island hundreds of years ago and its lasting influence can be tasted in a number of dishes that pair it with chicken or beans. Spices are important in Puerto Rican cooking, but that doesn’t necessarily translate into heat. The flavor profile is seasoned, but not fiery. Two indispensable recipes are sofrito and adobo. Sofrito is a blend of finely chopped garlic, onions, peppers, cilantro, culantro, tomatoes and spices cooked in annatto oil. It adds freshness and zing to many dishes. Adobo is an aromatic spice mixture that is rubbed onto chicken, fish, poultry and pork to impart extra flavor before cooking. It may include crushed peppercorns, oregano, salt, garlic, wine vinegar and freshly squeezed citrus juice. There are dry adobo rubs (seco) and wet (mojado). I never pass up a taste of Puerto Rico’s prized blood sausage, morcilla. Deep red, rich and delectable, it is traditionally cut into small chunks and fried or sautéed. As you might expect, fish is abundant and fresh. Puerto Rico is a haven for deep-fried foods, with bite-size fritters from sweet to savory taking a star turn. The best thing about San Juan’s street food scene is you don’t have to leave the beach to sample it. Pinchos are sizzling, seasoned grilled chicken on a stick. 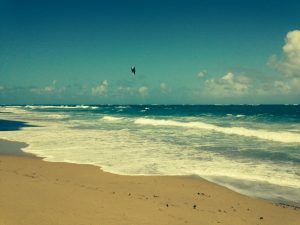 They are served at many San Juan beaches, including Playita del Condado, a pocket-sized beach in Condado favored by families and swimmers, thanks to its calm water. Where there are pinchos there are fresh coconut drinks. The sweet juice is the perfect foil for the piquant poultry. After a dip in the salty sea, few combos are as satisfying. Batitadas are refreshing fruit smoothies. They are sold everywhere, but there’s a reason so many Sanjuaneros favor Pinky’s version. This casual, inexpensive eatery is a few steps from a sandy swath of Condado Beach favored by kite-surfers. Each icy batitada is served in full-size blender, so consider sharing. Mango, guava and passion fruit combinations are loaded with fresh flavors. Puerto Rican coffee is legendary. Visiting a local plantation offers caffeine enthusiasts a firsthand look at the growing process. If your schedule doesn’t permit a visit, ordering an aroma-rich cup is the next best thing. When you’re ready for something stronger, Puerto Rican rum is the way to go. It’s the national drink and an important part of the economy. A visit to the industrial-size Bacardi Rum Factory is de rigueur, but there are dozens of local rums to sample. Try Ron del Barrilito, produced in small batches according to traditional methods. White rum is the hometown choice. Its subtle flavor and relaxed body mix particularly well in a daiquiri or mojito. As you stroll the blue-hued cobblestone streets of Old San Juan, try a rum-based cocktail at the Parrot Club on Calle Fortaleza. 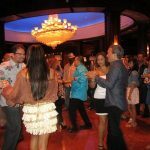 You’ll be warmly welcomed into an upbeat atmosphere that feels like a big party. 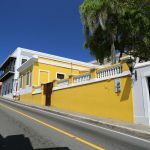 The colonial building will impress architecture buffs with its archways and beamed ceilings blended with colorful local art. 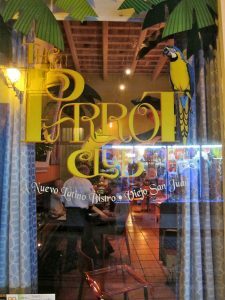 The Parrot Passion is their signature beverage. It’s a frosty blend of light rum, passion fruit juice and orange juice. My favorite is their classic mojito. One sip and you’ll be in mint-lovers nirvana. The food here is excellent, so stay for dinner or at least appetizers. The fish tacos, juicy fried dorado wrapped in a pliable shell, are noteworthy. The spicy fries pair beautifully with any cocktail. Island-brewed beers are widely available. Medalla is a light pilsner, easy to drink with Puerto Rican food. Mofongo is ingrained in Puerto Rico’s culinary identity. It mixes mashed green plantains with garlic and spices before pan-frying. Pork, chicken or fish is added to make it even more substantial. 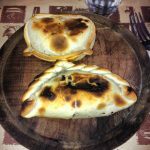 If you want to go where the locals go when they crave comfort food, head to El Jibarito. 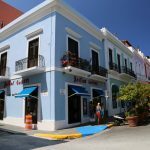 It’s located on Calle Sol, a quiet residential street in Viejo San Juan. This place is the definition of no-frills, with Formica tabletops, plastic-covered seats and low prices. The food is displayed cafeteria-style, so you can see everything before you order. Besides the delectable mofongo, try humble staples like rice and pigeon peas and garlic shrimp. 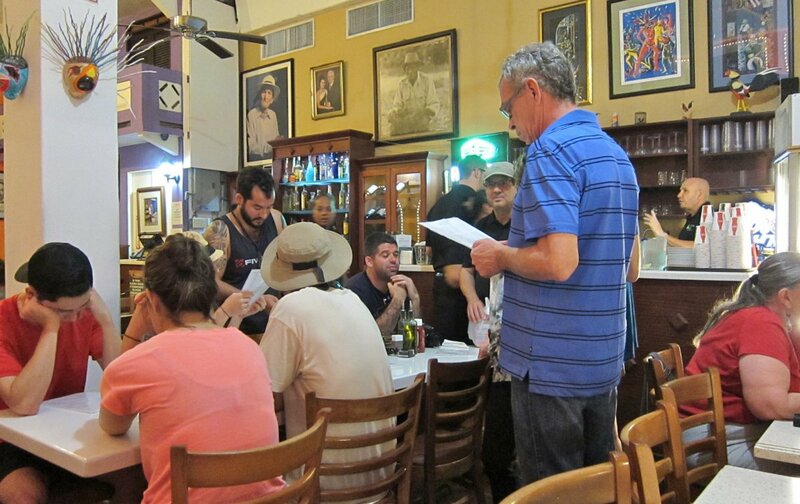 Dining at El Jibarito is as close as you can get to your own Puerto Rican abuela inviting you to supper. 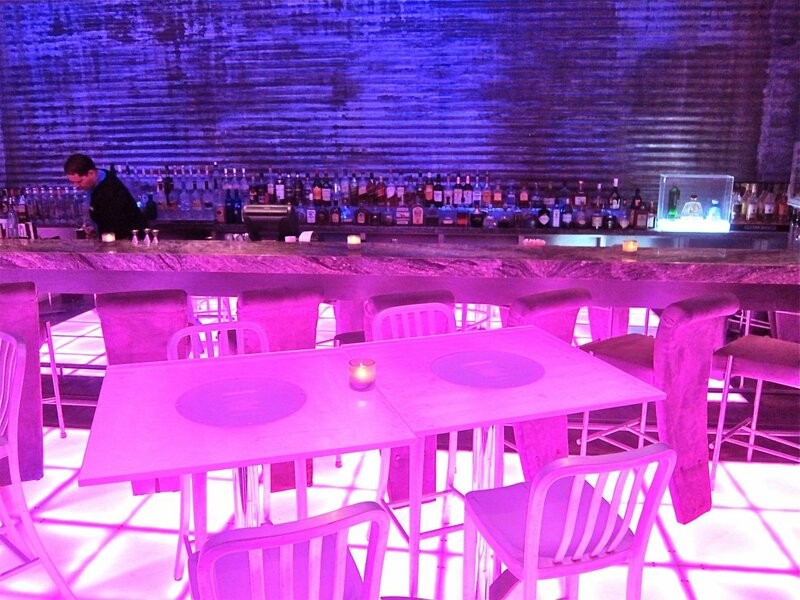 For a modern interpretation of Puerto Rican cuisine, book a table at Zest. 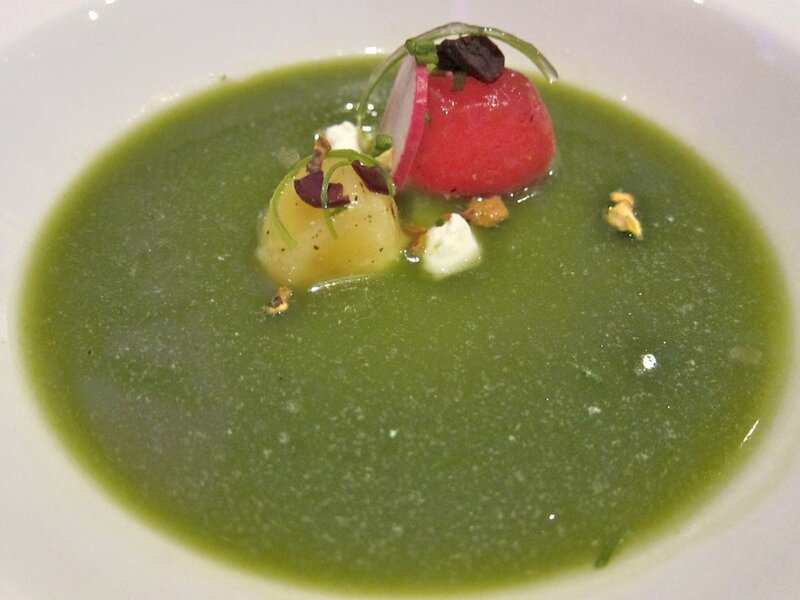 Zest is a culinary powerhouse and San Juan’s most memorable dining experience. It is located on the ground floor of the chic San Juan Water Beach Club Hotel, just steps from Isla Verde’s best beach. The boutique property’s 80 rooms are the height of easy sophistication. Staying here is a treat, but epicureans staying anywhere in San Juan shouldn’t miss the opportunity to dine at Zest. Start your evening upstairs at Mist, where the rooftop view is primo for watching the sunset over the ocean. 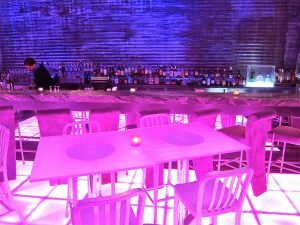 Enjoy a cocktail seated at the swanky bar or perched on a cozy sofa while you limber your palate nibbling on Socializers, tapas-like appetizers. I couldn’t resist the Spicy Tuna Tacos, with just enough heat to make me feel justified in downing a second cooling Mist Julep. After your aperitif, you’re ready to ride the elevator (complete with a photo-worthy glassed-in waterfall) down to Zest. The striking décor utilizes an abundance of stark white and bright blue for a hip nautical look. Once you step inside the carefully composed room, you won’t be surprised that each course is presented with as much precision as a precious painting. Influential tastemaker Chef Raúl Correa spins artful magic into everything he touches. Nowhere is his technique smoother than with seafood. His take on ceviche uses scallops sliced razor-thin and marinated only briefly, so the mollusk retains its essential bounce. It is playfully served with a crispy batata (sweet potato) chip, to compliment the scallop’s texture and to balance the marinades acidity. Eating the Compressed Watermelon Salad is a multi-sensory experience, from juicy fragrant melon to crunchy pistachio to creamy goat cheese. Gutsy Popcorn Soup is a foamy, truffle-enhanced wonder so innovative, it looks like a concoction straight from Ferran Adrià’s molecular gastronomy text. The mingling of flavors in the Miso-Glazed Sea Bass is a playground for your palate. The miso has an almost tobacco-like intensity that is tamed by a dollop of candied papaya compote sitting atop the flaky fish, adding up to the ultimate umami experience. I like to stay in Condado Beach. 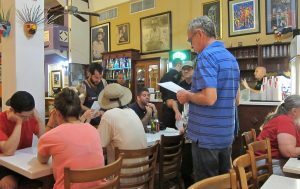 I spend the day with my toes in the sand and ride the #21 bus into Old San Juan for a night of eating, drinking and music at the Nuyorican Café, the international epicenter of salsa. One of my favorite beachfront hotels is The Condado Plaza Hilton, home to Pikayo, Chef Wilo Benet’s praised restaurant. The San Juan Marriott Resort & Stellaris Casino has some great dining options and incomparable service, plus a fantastic location on a prime surfing beach. The Doubletree by Hilton San Juan is an excellent budget choice. It is located just three blocks from a sparkling beach. For more information on planning your next Puerto Rican getaway, visit www.seepuertorico.com. I love the focus on the food! My mouth is watering! A really great article written about my favorite place in the world. You hit on so many of the great places to visit, dine and to enjoy about this wonderful island. Thanks, it made me smile.